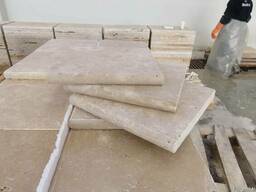 Founded in 1993 as a foreign trade company, Solemar Marble Ltd. is a family owned manufacturer and exporter of high quality natural stone products. Our factory and the headquarters are located in Denizli, Turkey, where the most beautiful Turkish travertine is found. Our monthly production capacity is 30,000 m2 (325,000 sqft) and we export 95% of our production to 16 different countries across the globe. Keeping the steady growth since day one, in order to better serve our customers, in May 2015, we moved to our new factory in Kocabas, Denizli, Turkey. Our new factory is 3 times as big as the previous one we had been operating since 2007. Please click for pictures of our new factory. 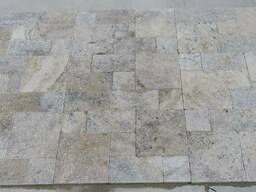 Our products range from the two types of the world famous Denizli travertine to other travertine colors such as Ivory, Noce, Silver and Gold travertine as well as limestone, unique marble and onyx colors from Turkey. In addition to our standard production in regular U. S. and European sizes, we have also completed many special projects in 7 different countries. Thanks to our years of experience in the market, we have a very strong network with various natural stone quarries and access to multiple colors of natural stone in Turkey. We pride ourselves in employing the highest quality control standards in the industry, which allows us to consistently provide high quality products. The quality control process starts at the quarry with the selection of the blocks by our engineers and experts. We follow a seven-step quality control process at our factory, including the packaging, loading, and shipment of the material to meet our standards and our customers’ expectations. 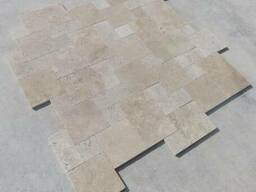 Our mission is to provide our customers with the highest quality natural stone products and best customer service at competitive prices. As a customer and market oriented company, we strive for the highest customer satisfaction.